Last evening, Ellicott City celebrated its 40th Annual Midnight Madness. The annual event occurs on the first Friday night of December and Chris and I have attended many of them during the past years. What was amazing is that the businesses conducted the Midnight Madness this year after the devastating flood during May. The city is rising from the ruins. Many of the businesses and storefronts remain closed, but many others were open. It was a festive time and the shops that were open were doing great business. It was a cold December night, but the Christmas cheer served in many of the businesses on this special night helped keep our spirits warm. We enjoyed walking the nostalgic streets, listening to carolers, sharing the joys of the season with other shoppers and the merchants. 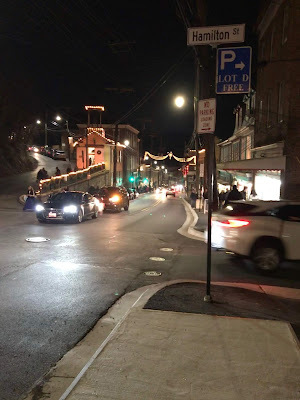 Walking the Main Street, Ellicott City at night reminded me of my childhood in Ithaca shopping for Christmas presents up and down State Street in Ithaca, back when cars used to be able to drive through the main business area. Christmas is alive, at least in Ellicott City.